Daniel Henry Foxwell was born in Cambridge, MA on March 6, 1910, the son of Martin Henry Foxwell and Mary Ann Meekins, he had two brothers, Eldridge and Harry, and a sister, Margaret. Mr. Foxwell attended public schools in Cambridge and was graduated in 1927. He joined the 29th Division Company C in 1930. He was working for Herbert Hearn Hardware in February 1941 when he was called to active duty with the 29th Division Post No. 88 National Guard. 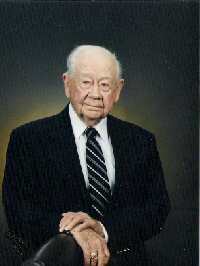 He was transferred to the Army Air Corps and entered World War II as a 2nd Lieutenant. He served at Craig Field, Selma, Alabama; Smoky Hill Air Force Base, Salina, Kansas; and Davis Monthan Air Force Base, Tucson, Arizona. He was part of the original cadre assigned to the 39th Group, and served overseas in the Pacific Theatre on Guam with the group in Operations as Adjutant. While in the 39th BG, Foxwell served under Captain Claude J. Hilton, its first Commanding Officer, as higher ranking officers were assigned they assumed command – these included, in order, Major Gordon R. Willis, Lieutenant Colonel Campbell Weir, Colonel Potter Paige, Lieutenant Colonel Frank P. Sturdivant, Colonel George W. Mundy and Colonel James E, Roberts. Foxwell mentions that he enjoyed working with the command officers and also remembers fondly M/Sgt Walter Denkewalter. He returned to the States in September 1945, and was separated from service July 1946. He remained in the USAF Reserve, however until March 1970, when at the age of 70 he was placed on the Retired List with the Rank of Lieutenant Colonel. On December 23, 1939 he married the former Martha Simmons. They have two daughters, Mary F. Duvall, and Margaret Shipley and a son, Henry Talmadge Foxwell; five grandchildren, James C. Duvall, Lt. Commander Matthew Shipley, Jennifer B. Shipley, Diana Foxwell, Lisa Tedesco; and four great grandchildren, Nicholas and Thomas Tedesco, Josh Shipley and Danielle Graham. After the war he was employed by Donald Bennett Chrysler-Plymouth from 1946 to 1958, He was later employed by Lawrence Volkswagen, Salisbury, MD until he retired in 1980. In his earlier years he enjoyed playing baseball and tennis. He later enjoyed playing golf until he was 89. Lt. Col. Daniel Henry Foxwell, retired, passed away at Dorchester General Hospital on Tuesday, September 28, 2004 at the age of 94. He is interned at Dorchester Memorial Park. Bio of Captain Daniel H. Foxwell “History of the 39th BG WWII” published 1996.